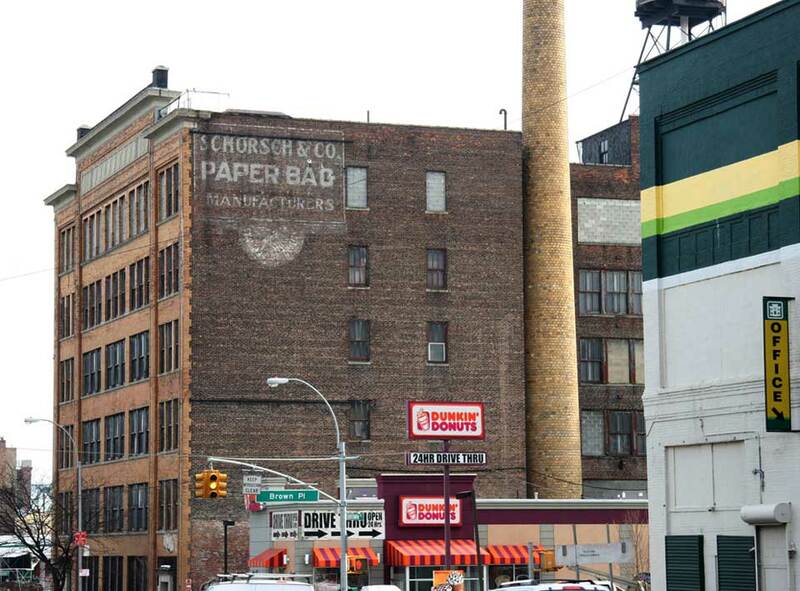 Schorsch & Co. began as paper manufacturers on Desbrosses St. in Manhattan around 1901. They had several other Manhattan locations (notably 510-516 East 73rd St., from 1906 to 1913) until they relocated here in the Bronx in 1913. This building on the southwest corner of Brook Avenue had the address 500 East 133rd St. until 1941 when East 133rd St. was renamed Eastern Boulevard. The address then became 120 Eastern Blvd. Only a few years later (1944) Eastern Boulevard was renamed Bruckner Boulevard. So the address became 120 Bruckner Blvd. Schorsch & Co. were located here until 1951 when they went out of business. The founders of Schorsch & Co. were Isaac E. Schorsch (1868-1918), David Schorsch (1870-1920), and Henry Kurniker (1874-1966). Isaac and David Schorsch were the nephews of Moses Schorsch (1840-1920), an immigrant from Germany who was a butcher living at 246 East 68th Street, New York, in the 1900 U. S. Census. Henry Kurniker was listed as an officer in the company as early as 1904. In David Schorsch's death notice, New York Times, 20 Jan. 1920, pg. 7, Henry Kurniker is called David Schorsch's brother. They both appear in the 1880 U. S. Census as the sons of J. Kurniker, age 46, a merchant, born Prussia, living in Huntsville, Alabama. Henry Kurniker is identified as H. Kurniker, 6 years old, born Alabama. David Schorsch is identified as D. Schorsch, age 10, born New York. Ron Schorsch, a great-grandson of first cousins to the Schorsch founders, writes in an email, "I suspect that Isaac E. and David Schorsch's mother Babette Schorsch re-married Henry Kurniker's father Jacob Kurniker." This accounts for the difference in surnames. Another Schorsch descendent further clarifies the Schorsch/Kurniker relationship: "Babette Hirsch Schorsch Kurniker was born in Germany in 1839, married Emanuel Schorsch, had two sons (Isaac E. Schorsch in 1868 and David Schorsch in 1870), moved from New York to Seale, Alabama in 1870, married Jacob Kurniker in 1873, and had 5 more children with Jacob Kurniker (Henry, Rosa, Annie, Benny, and Simon). Babette's son Henry Kurniker became a partner in Schorsch & Co. with his half-brothers Isaac E. and David Schorsch. Babette's first husband Emanuel Schorsch died in 1870, leaving her a widow with two sons. I think Babette had brothers living in Alabama who owned "Hirsch Bros" of Uniontown, Alabama. Her brothers probably invited her to move there. After being in Alabama for 3 years, she married Jacob Kurniker in 1873. I think that Babette's first husband Emanuel Schorsch was born on February 18, 1837 and died on August 30, 1870, and here is his grave in Cypress Hills Cemetery in Brooklyn, NY. https://www.findagrave.com/memorial/167902329/emanuel-schorsch. Cypress Hills Cemetery wrote to me that Emanuel was interred on September 1, 1870 in Levy Lodge, Section 1 of the cemetery. Babette Hirsch Schorsch Kurniker is buried in Linwood Cemetery in Columbus, Georgia: https://www.findagrave.com/memorial/59938219/babet-kurniker. Here's the history of various Kurnikers buried in Linwood Cemetery: https://archive.org/stream/Muscogiana1034CSU/Muscogiana1034CSU_djvu.txt." J. Kurniker was Jacob Kurniker (1837-1915). In the 1900 U. S. Census he lived in Columbus, Georgia, with a daughter, Jennie Zacharius, two of Henry Kurniker's sisters, several nieces and nephews, and a brother, Gus Kurniker. One of Moses Schorsch's sons, Jacob Eisinger Schorsch (1886-1954), became an officer at Schorsch & Co. in the 1910s. Also involved in the company was Emanuel I. Schorsch (1901-1950), a son of Isaac E. Schorsch, and grandson of Moses Schorsch. Isaac E. Schorsch married his cousin, Sophie Schorsch (1882-1967), in 1900. Emanuel I. Schorsch was born 13 December 1901. His mother remarried (in 1924) after Isaac E. Schorsch's death. She survived her son and is named in his death notice New York Times, 10 April 1950, pg. 16, as Mrs. Sophie Schorsch Levi. Jacob E. Schorsch registered for the World War I draft in 1917 when he was 30 years old and a manufacturer at 500 East 133rd St. A story in the New York Tribune, 28 Sept. 1917 pg. 4, indicates that his application for exemption from the draft was rejected: "The District [Draft] Board yesterday reversed its previous decision in the case of Jacob E. Schorsch, of 38 West Seventy-ninth Street, who claimed exemption on the ground that he is contributing $2,000 a year to his infirm father, eighty-three years old, "solely depending" on him. An investigation showed that two sons and two daughters are living with the senior Schorsch, and the whole family constitute a paper box manufacturing firm which last year did a business of $1,000,000. Jacob Schorsch will have to serve in the army."